Casino revenues in the world's largest gaming centre, Macau, fell almost 20% in November from a year ago as gamblers' appetite for the gambling hub continued to wane. 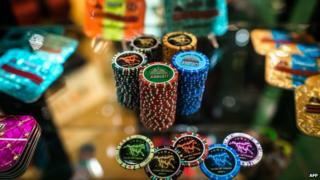 Gambling revenue from the Chinese territory's 35 casinos was down to 24.3bn patacas ($3bn; £1.9bn). That marked the sixth consecutive decline on an annual basis and the fifth consecutive monthly drop. Macau is the only place in China where casinos are allowed to operate. However, the government's recent anti-corruption drive has resulted high-stake gamblers cutting back on spending. Continuing pro-democracy protests in Hong Kong may have also resulted in preventing tourists from visiting Macau, which is a short ferry ride from the island. In October, the hub recorded its worst gaming revenue on record as sales fell by more than 23% from a year ago. The city is the world's largest gaming centre, ahead of Las Vegas in the US.